Carter Capps, called for an illegal pitch by 1B Umpire Brett Terry, who ejected Capps' Manager Rod Barajas in an application of professional baseball's new pitchers' rubber restriction rule, himself was ejected by HP Umpire JJ January after hitting January with a bouncing pitch during Sunday's El Paso Chihuahuas vs Albuquerque Isotopes game in the Pacific Coast League. 1B Umpire Brett Terry ejects Rod Barajas. 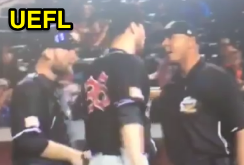 With none out and none on in the top of the 8th inning of the Chihuahuas-Isotopes game, Capps threw a 0-0 pitch to Isotopes batter Dustin Garneau, ruled an illegal pitch by 1B Umpire Terry. 3B Umpire Lee Meyers then called Capps for a second illegal pitch due to a similar pivot foot reset motion on the 1-2 delivery. 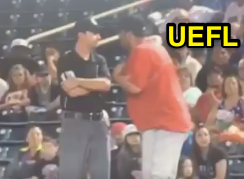 As a result of an ensuing argument, 1B Umpire Terry ejected Chihuahuas Manager Rod Barajas. Replays indicate that in both instances, Capps' illegally reset his pivot foot in his delivery of the pitch, the calls were correct. After an ensuing foul ball, Capps' final pitch in the dirt bounced and hit January. Replays indicate that as January paused to recover at home plate, Capps appeared to make a comment toward January, resulting in a confrontation and ejection; Capps and catcher Rocky Gale had a conference at the mound immediately preceding the fateful pitch. At the time of the ejections, the Isotopes were leading, 9-5. The 'Topes ultimately won the contest, 12-5. Wrap: El Paso Chihuahuas vs. Albuquerque Isotopes (PCL), 6/25/17 | Video via "Read More"